Saving For Your Future » Investing » Vanguard Investor UK review – is it the best in the market? Are Vanguard tracker funds the cheapest? How does Vanguard Investor work? Which Vanguard Lifestrategy fund is best for you? Vanguard Asset Management (known simply as Vanguard) is authorised and regulated in the UK by the Financial Conduct Authority (FCA). Vanguard was founded in the US by John Bogle in 1975 and made its name by offering low-cost index tracking funds which are among the best and cheapest index tracking funds to invest in. Vanguard is now a global brand and there are over 20 million individual investors worldwide who own Vanguard funds. What makes Vanguard stand out as an asset management company is that it is owned by the funds that people invest in rather than by shareholders. This supposedly means it is more focused on good investor outcomes rather than profit. Historically UK investors have only been able to invest in Vanguard funds through either an investment broker or fund platform, such as Fidelity Fundsnetwork or Hargreaves Lansdown. However, Vanguard has now launched its own investment platform called Vanguard Investor which sells its existing range of tracker funds directly to consumers cheaper than any other fund platform in the UK. What is an investment tracker fund? To understand what an investment tracker fund does (and what Vanguard specialises in) it helps to understand the difference between active and passive investing first. If you are looking to invest in funds there are two main strategies - active management and passive management (I explain the difference between the two below). Vanguard specialises in the latter but does offer a limited number of actively managed funds. There is a lot of debate over whether active funds or passive funds are best to invest in. However, every research white paper I've studied that claims either methodology is better than the other always makes one flawed assumption. That assumption is that you have to buy and hold a fund almost indefinitely. Investors can boost their returns by regularly reviewing their investments and making changes where appropriate, they certainly should not buy and hold indefinitely. The other flawed assumption is that it is a binary choice when deciding between active and passive funds. Of course both strategies (active or passive) have their place and will outperform one another at different times. Investment trackers are passive funds that aim to mirror the performance of a selected stock market index, such as the FTSE 100, or the price of an asset. An investment tracker fund does this by buying shares, in the case of an equity index, in the relevant proportions in order to replicate the index in question. So rather than an investor having to own all of the shares themselves, which would be expensive and cumbersome, they instead invest in an investment tracker fund and benefit from the economies of scale. This is a form of passive investing and more often than not is managed and run by a computer algorithm rather than by a fund manager. This radically brings down the cost of running the fund and ultimately the cost to invest into it. Individual fund houses decide how best to replicate the performance of an index via an investment tracker. This is typically done in one of two ways. Full replication - this is where the fund invests in all the constituents of the chosen index using the same weightings to closely match the makeup of the index. So in the case of the FTSE 100 they would invest in all of the companies in the FTSE 100 in the same proportion as they are represented in the FTSE 100 Index. Partial replication - rather than invest in every constituent of an index the tracker fund instead invests in a representative sample of the index. To do this the investment tracker fund may only invest in a certain number of companies from a given sector or geography. This in turn reduces the number of holdings which makes it easier to manage while also reducing the transactional costs. These two categories can be split further. There are two ways in which index trackers can perform the actual replication. They can use physical replication (where they own the asset), or synthetic replication (where they use financial instruments to replicate the performance of the asset they are trying to track). Also trackers typically come in two structures, namely unit trusts (OEICs) or exchange-traded funds (known as ETFs). Unit trusts are the most prevalent type of fund and are available via most Stocks and Shares ISAs and pension products. Unlike unit trusts, which are priced and traded once a day, ETFs can be traded more like shares. That means you can trade them throughout the day which allows you to move in and out of markets quickly. However, bear in mind that most investment platforms will charge additional fees for investing and trading in ETFs. Investment trackers is where Vanguard excels. Does Vanguard produce the best investment tracker funds? The best investment trackers are those that closely track their chosen asset or index (with a minimum tracking error) and that also keep costs to a minimum. Preferably they should also track the asset or index by fully replicating it and physically purchasing the required assets or shares to do so. The reason why physical replication is preferable, as opposed to synthetic replication, is because the latter mirrors the performance of the asset using financial derivatives. That means that a third party is involved to deliver the returns that the investment tracker is trying to replicate. Of course that then introduces the risk that this third party goes bust, which is known as counterparty risk. Vanguard's funds physically replicate the indices they track, by either using full replication or, more commonly, a sampled replication. One of the major attractions of Vanguard funds and its investment platform is the low cost. an annual account fee of 0.15% on investments up to £250,000 which is less than half of the industry average. over £250,000 there is no annual account fee. That means that there is a maximum platform fee (annual account fee) of £375. This is incredibly cheap but actually not the cheapest way to own Vanguard funds, which I will shortly come on to. Vanguard's ongoing fund charges range from 0.06% to 0.8% which again is far lower than the industry average. There are occasional fund entry charges of between 0.2% to 0.8%, where applicable. The first thing to notice is that the two FTSE 100 ETF trackers slightly underperform the FTSE 100. That is because of a) their tracking error and b) their respective annual fund charges. The tracking error is a measure of how well an index tracker follows the index it's tracking. The lower the figure the better. Both ETF trackers have a tracking error of just 0.01 which is as good as it gets. In addition both have incredibly low charges with the IShares FTSE 100 tracker being marginally cheaper, which accounts for its slightly higher performance. But this is negligible. So both of these trackers have low charges and low tracking errors. They both also physically replicate the FTSE 100 (see last section) which is a positive. However despite IShares being a market leading ETF provider DIY investors still have to buy them via a third party broker or platform like Hargreaves Lansdown or Fidelity Fundsnetwork. As such these platforms add their own platform fee on top of the quoted OCF which is typically around 0.45%. However, with Vanguard launching the Vanguard Investor platform investors can now buy Vanguard funds directly from Vanguard but with a platform fee of just 0.15%. Overall this makes Vanguard funds among the cheapest investment tracker funds in the market when taking into account all charges including platform charges, but only if an investor uses their platform. However, it is not necessarily the cheapest way for all investors who want to own Vanguard funds as I explain in the next section, plus there are some limitations in just using Vanguard Investor. Assuming that you like Vanguard funds and their low fees the cheapest way for most investors to hold their funds would be via Interactive Investor (known as ii). Interactive Investor is the second largest investment platform in the UK and is the largest to operate a fixed fee model. Interactive Investor charges £22.50 every quarter (i.e £90 a year) regardless of your portfolio size. The underlying fund charges for investing in Vanguard funds is identical on both platforms, i.e Interactive Investor (ii) and Vanguard Investor. Because Vanguard Investor's platform fee is based on a percentage of the amount you hold with them (up to a maximum charge of £375 a year) that means if you invest over £60,000 in Vanguard funds then the cheapest way to do so is via Interactive Investor. If you never plan to hold more than £60,000 in Vanguard funds then investing via Vanguard's own platform (i.e Vanguard Investor) would be cheaper. However, you can only invest in Vanguard funds (as Vanguard doesn't offer anyone else's funds on its platform) and there's not even a pension product. Conversely for most people using Interactive Investor will not only be cheaper but you can hold your investments in a pension product (as well as a Stock and Shares ISA, Junior ISA or General Investment Account). You also have the choice of thousands of investment trusts, ETFs (including a version of the iShares ETF mentioned in the last section) and unit trusts from hundreds of investment companies, if you so wish, as well as access to direct share dealing. It's why I personally would take out an Interactive Investor account instead of a Vanguard Investor account. That's especially true now that Interactive Investor no longer applies exit fees if you decide to stop using them and transfer your money to another platform. So in theory, if you invested via ii and eventually decided that you would rather use Vanguard Investor instead (perhaps you end up investing less then £60,000 in Vanguard funds) then you can transfer across without penalty. Vanguard Investor is Vanguard's own platform which allows you to purchase and administer a portfolio of Vanguard funds. This negates the necessity to use a third party broker/platform or financial adviser to invest in Vanguard funds. Vanguard Investor is suited to DIY investors who are confident in making their own investment decisions both in terms of the overall asset mix of their portfolio and the actual funds to invest in. If you choose to invest through the Vanguard Investor you get three product choices as shown below. 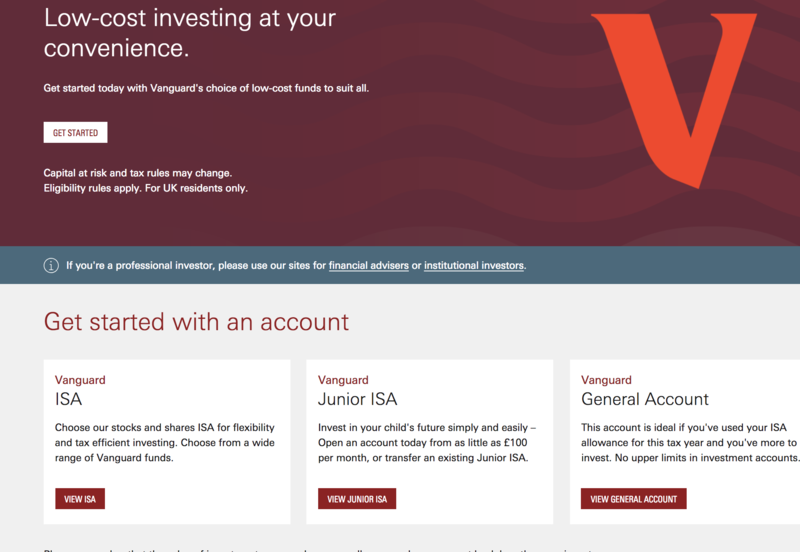 You can select to buy Vanguard funds within a Stocks and Shares ISA (with a £20,000 maximum contribution in the current tax year), a general investment account or via a Junior ISA (with a maximum contribution of £4,260 in the current tax year). Any growth and income generated within the respective ISA wrappers will be tax free. However, any growth and income generated via the general investment account are liable to income tax and capital gains tax. Interestingly Vanguard Investor doesn't offer a pension product to invest through. I am surprised at the omission of a SIPP (a self-invested personal pension) at launch but they had planned to introduce one during the 2017/18 tax year but it never materialised. This is a drawback for those wanting to invest for their retirement. For those wanting to invest via a pension should read the section below on Vanguard alternatives. Investors can open a Vanguard account with a minimum lump sum investment of £500 or a minimum regular monthly investment of £100 or a combination of the two (other platforms do offer lower minimums). If you invest directly with Vanguard online you have a choice of 73 funds to choose from (see next section for more details). What can you invest in using Vanguard? Vanguard also offers 22 fixed income and bond funds as well as the 17 blended funds. The 17 blended funds include the popular Vanguard LifeStrategy fund range. What are Vanguard LifeStrategy funds? LifeStrategy funds offer 5 different blends of equities and bonds which allow the investor to target a level of risk and return that is right for them. There are five funds with vary degrees of equity exposure. LifeStrategy 100% equity fund is wholly invested in equities and is the highest risk fund with the potential for superior returns but with a higher level of risk, volatility and potential loss. As illustrated by the above story in the Telegraph I am regularly asked by the national press for my expert view on a range of investments and platforms. Vanguard's Lifestrategy funds provide a diversified asset mix asset based upon the level of equity exposure you desire. In reality they are ready-made portfolios of Vanguard tracker funds. The funds do have a US equity focus with typically around 25 -30% of assets invested in US equity trackers. This obviously has a significant bearing on the performance of these funds. During periods of US equity outperformance, such as we had in the last few years, Vanguard funds will do well. However due to their broad asset mix they tend to lag when a particular sector or geographical equity market (other than large cap US equity funds) outperform. At present US equities are expensive on a historical basis so their expected future return in less than 1% a year in the near term. If this comes to fruition it will impact the performance of the more equity focused Vanguard Lifestrategy funds. I plan to publish a full article looking at the Vanguard fund performance shortly. However, as most Vanguard funds are simple trackers their performance just reflects that of the underlying index they track. For that reason I am more interested in the performance of their Lifestrategy funds as these will likely be the funds that most novice investors purchase via the Vanguard Investor platform. The table below shows how the performance of the Vanguard Lifestrategy funds has fared versus their peers from their respective sectors. As you can see the performance of their Vanguard Lifestrategy funds is never going to be record-breaking for its sector but it is consistent. More importantly, the Lifestrategy funds are seldom in the bottom half of the performance league tables, suggesting above average performance. While it is a personal choice I suggest that you use the age guide principle as a starting point if you are choosing a Vanguard Lifestrategy fund. So for example a person who has a medium attitude to risk and is 60 years old might want to invest in the Vanguard LifeStrategy 40% Equity fund. The equity exposure is determined by taking your age away from 100. So in this example 100 - 60 = 40. A 50 year old could combine Vanguard Lifestrategy funds to achieve a 50% equity exposure (i.e. invest half their money in Vanguard LifeStrategy 60% Equity and the other half in Vanguard LifeStrategy 40% Equity). If you are risk averse then you need to lower the equity value which you ultimately choose. So a risk averse 60 year old would choose perhaps the Lifestrategy 20% Equity fund. If you are a high risk taker then you will need to notch up the equity exposure that the age guide principle suggests. This process forms the basis of many City-based discretionary managed services believe it or not. To assist in choosing a Vanguard Lifestrategy fund I have built an investment portfolio calculator that will show you the broad asset mix you can expect based upon your age and attitude to risk. How does Vanguard manage its funds? All LifeStrategy funds are managed closely ensuring that each fund is automatically balanced to reflect the risk and return profile of the fund selected. As management of LifeStrategy funds is automatic this means they are useful for investors who want to get the benefit of equity exposure without the need to keep tinkering with their investments to get the best return. How does Vanguard calculate risk tolerance? There is a section on the Vanguard website titled Your investing goals which presents six of the most common investment goals. When a goal is selected there follows a comprehensive question and answer section which will help an investor decide their level of investment risk tolerance and how best to achieve their investing goals. How do Vanguard's fees compare to other platforms? Earlier I compared the underlying fund charges (OCF) of a typical Vanguard tracker with those of one of the most keenly priced competitors. However, how does Vanguard compare if you are investing in one of its Lifestrategy funds? After all most investors (rightly or wrongly) still choose to invest in a single mixed-asset (blended) managed fund. The table below compares the approximate total charge for someone investing their annual ISA allowance in a managed fund with leading fund platforms. I have ranked the table with the cheapest at the top and the most expensive at the bottom. Which Vanguard funds are the best? The problem for inexperienced investors using Vanguard Investor is knowing which tracker funds to invest in. First you'd need to decide your desired asset mix and then decide which trackers to pick. For novice investors or those not wanting to manage their portfolio themselves the Vanguard Lifestrategy funds are most suitable. However those who want to build their own portfolio will find our investment portfolio tool useful. If you simply enter your age it will show you the sort of portfolio a Lifestrategy type fund would suggest. You will see the percentage exposure to different types of assets such as UK equities. You can then tinker with this yourself and then invest in individual Vanguard tracker funds for each asset. This has the benefit of enabling you to reduce the heavy US equity exposure that Vanguard Lifestrategy funds have. Vanguard Investor has been labelled as a robo-advice firm by the press. The term robo-advice is a very misleading in my opinion as it is used as a catch-all label for any online investment platform that automates much of its investment management and selection. Vanguard is without one of the cheapest ways to invest for UK investors but research has shown that only 3% of consumers would let a 'robot' decide and act on their behalf when it comes to financial matters. Unlike Vanguard other robo-advice firms do have a more human element to their processes behind their online investment platform. For many UK investors this is preferable. If you are focused purely on costs or want to find the cheapest way to invest in Vanguard funds then Vanguard Investor is for you. However if want the cost benefit of using investment trackers but with a human strategic overlay then there are a number of other robo-advice firms you might want to use which are only marginally more expensive, which I cover in the next section. The drawback of a purely passive route with no strategic overlay is that you are totally at the whim of the market. That is a good thing if markets are rallying but a bad thing in a severe market sell-off. The Lifestrategy funds go some way to addressing this but my experience suggests that the asset mix doesn't actually change that much over time. For those investors wanting to enjoy the cost savings associated with using passive trackers but with a more human strategic overlay should consider the likes of Wealthsimple or Moneyfarm. As you can see from the cost chart above that Wealthsimple, in particular, is one of the cheapest ways to invest in a managed portfolio and they also offer a pension product as well as a junior ISA, a Stocks and Shares ISA account and a general investment account. Furthermore, Wealthsimple does not have a minimum investment amount, unlike Vanguard or Moneyfarm. This means that you can open an account with them and trial their service with a small initial investment before deciding to commit more. 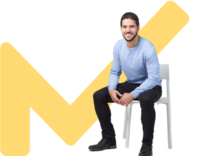 With Wealthsimple you can also have the first £10,000 of your money managed for free for the first year via this offer (you only have to pay the cost of the underlying ETFs they use which is 0.2%). 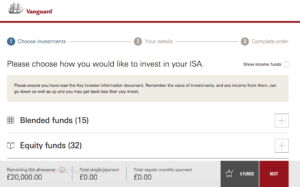 However, Moneyfarm also runs an offer that gives you half price management fees on an ISA for the first 12 months, which isn't reflected in the comparison chart above. What protection is there from Vanguard going bust? Vanguard Investor has been a game-changer for the industry and it has sparked a price war amongst platforms. It also means that fund managers have to justify their more expensive annual management charges by providing additional performance. Vanguard Investor is the cheapest ways to invest in Vanguard funds if you have less than £60,000. However if you want to invest more than £60,000 (even over time) it is cheaper to use Interactive Investor to buy Vanguard funds. The other big benefit of using Interactive Investor is that they have a pension product (which Vanguard still doesn't have) and you can invest in thousands of unit trusts, investment trusts ETFs and shares (Vanguard only offers you access to their own 73 funds/ETFs). Vanguard's Lifestrategy funds are a good one fund solution for many investors (Interactive Investor even promote them as such - see my full Interactive Investor review) but there is limited human strategic overlay. In addition while performance is good it seldom tops the charts, although more importantly it seldom props up the charts. With the advent of robo-advice propositions it is possible to enjoy similar cost savings to that of Vanguard but with a more strategic human overlay and better user experience via the likes of Wealthsimple or Moneyfarm. If you want to run your investments yourself strategically then you are still better off using a fund platform with a wide range of funds on offer, but perhaps investing in any Vanguard funds via Vanguard Investor. You can see our analysis of the best investment platforms here. While Hargreaves Lansdown remains the UK's most popular investment platform, Interactive Investor remains the obvious choice in this instance. Vanguard Investor is a game-changer for the industry as it has sparked a price war amongst platforms. It will also mean that active fund managers will have to justify their more expensive annual management charges by providing additional performance. There is currently no pension wrapper. It is possible to enjoy similar cost savings to that of Vanguard but with a more strategic human overlay and better user experience via the likes of Wealthsimple or Moneyfarm.